There is always a good audience for traditional fantasy. The components are familiar and authors (like myself) who elect to write something that appeals to readers who want to settle down into a story loaded with magic, Elves, wizards and warriors where a plucky underdog or two wins the day against an evil villain finds they have quite a market. The better writers find a way to juggle up the usual fayre and bring something unique to the meal. Wizard of Wisdom pitches for this audience. 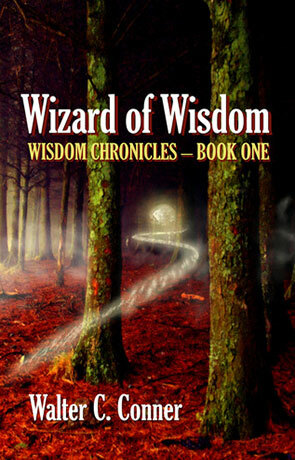 Wisdom of the title is a village where Wil – initially our viewpoint character wakes up from drunken oblivion in a pig pen. This opening chapter seems to promise quite a comic spin on the overly serious tone fantasy can take at times with a reel of richly dark description revealed as the aforementioned animal house and the overly complex angst of our hero is quickly tempered by his introduction to a simple life working with his new friend Scrublein - Scrubby to his friends – who turns out to be the book’s best character. Conner builds from this moment pretty well, although we struggle to identify with Wil as we don’t know enough of his past life. When his belongings show up with a trader we’re given a hint, but in the initial stages Wil refuses to be drawn into explaining much as his past was what drove him to despair. A little amnesia here or a short confession might have helped. Elsewhere we have high level power politics at the court of Gleneagle and its here we start to get a true measure of Conner’s tone. There is a vaunt to the dialogue that gives it an archaic quality, and an impersonal flavour to the exposition that distances the reader from the scene, almost as if you were observing through a window. The beginnings of our fantasy binary establish themselves here with Greyliege introduced and painted as a wizardly villain after he doesn’t get what he wants and storms out of the court in a well-dressed strop. The story continues, shifting context back to Wil then to Morgan and Peg and so on. There’s a patchwork quality to this, like other fantasy writers might employ, but it is fitful and the choice of scene order doesn’t feel as purposed as it might in places. The text is also a little weighty in some moments and not weighty enough in others and occasionally this serves to highlight the plot contrivances all writers need to make to get their characters in the right places. Also, the detail can get in the way and this is reflected in how Conner writes action, particularly in the crucial conflicts at the end of the book. These moments are a study of the details rather than something we invest in emotionally. In Wizardry and Wild Romance, Michael Moorcock talks of fantasy’s exotic landscapes and the interweaving of a rich descriptive tradition into the ideas of the writer. In Wizard of Wisdom, we have some well-grounded images, the aforementioned pig pen, the Old Forest and others. However, the story is overburdened with exposition at times, leaving you feeling as if the characters have no aims. This also serves to make the plot unfold fitfully as we are diverted into backstories and the day to day needs of people on their quest (travel, make camp, eat, sleep, etc.). This certainly has its uses in allowing time for discourse and might interest a reader who is dipping in and out of the book. You do get an image from this, like a series of paintings the writer might be trying to convey. The stakes of the plot gradually ramp up as we move towards the crucial battles and Conner handles the numbers well, giving you a good portrayal of his fantasy geopolitics. At this point you feel he is on better ground as the scale requires some abstraction. The conclusion sets up for sequels and whilst the binary established at the start is apparently resolved, you get the sense there’s more to come. Written on 6th May 2015 by Allen Stroud.